What do you get when you put a Navy SEAL, a jujitsu belt, and some parachute webbing in a room together? Well, if you’re lucky, a wildly successful world-class exercise equipment system. Supermodels, pro athletes, Ivy League college sports teams, and the US army are just a few of the more noteworthy clientele of an invention that started in exactly that way. Randy Hetrick was a Navy SEAL squadron commander when he decided to address the problem posed by deployment: maintaining peak physical condition, but minus the luxury amenities of a gym. Using a jujitsu belt and parachute webbing, Hetrick created for himself the first of what would years later be known as the TRX suspension system. It’s a highly portable performance training tool that leverages gravity and the user’s body weight to complete hundreds of exercises. By using gravity and weight, the TRX makes for better balance, strength, flexibility, and core stability simultaneously. The concept is pretty simple: use body weight and gravity to manipulate the body you have into creating the one that you want. In essence, TRX makes your body act as your machine. There are some obvious advantages to this. When you’re only using gravity and your own body weight as your main workout tools, the need for expensive machines is eliminated, though of course the option to supplement is always there. Suspension training hits much the same sweet spot as low-impact sports like swimming, going easier on the joints and reducing the risk of injury while still getting the heart pumping and torching calories. And like rolling around in a pool, your range of motion is more complete, more fluid, and you can build lean muscle while also gaining flexibility and mobility — like you would be able to using yoga and pilates exercises, just a bit more drastically. You don’t have the limitations of 90-degree angles, but can expand in your space and utilise muscles that traditional equipment won’t reach or cultivate. Another benefit is that you control the pace, the resistance, and how far you push yourself. If you’re like me, it’s actually easier to test your physical limits when on your own, isolated to comparing your progress against yourself instead of the person next to you. Classes are loud and crowded, running can get repetitive, and things like Crossfit can feel more intimidating than immediately useful. And if you want the benefits of a class without the bill or the trek, you can tune into classes TRX broadcasts live on Periscope occasionally. But perhaps the really major selling point of TRX is its unparalleled versatility. You only have to take a look at their Instagram account to realise that users really are taking their TRX equipment outdoors to parks, beaches, mountains, and anything that they can wrap their gear around. If you get bored with your routine, you can switch up the landscape. And if you’re travelling for work or stuck at home watching the kids, there’s no real excuse to break from your routine. And minus the prep and travel time to the gym, you might find it’s actually easier to commit to. Instead of using solely weight machines, TRX allows you to build functional strength — strength that applies to real life. Your muscles are adjusting and growing to accommodate the fluid and practical challenges posed to it by the very body that’s changing. Your muscles are pitted against each other, rather than an external object. You aren’t just pressing down and up on a machine, but moving in and out of different challenges to whole muscle groups, getting a more complete and effective workout, organically, with a body that will actually serve your everyday life. The odds of looking misshapen and unnatural take a much lower concern level. TRX TrainingThe TRX system is designed for hyper-versatility and can be used anywhere you are. Even though it’s the same equipment supermodels use to get in shape after having a baby or pro football players use to stay lithe and fit, it’s actually extremely affordable. Their most minimal option is just $A165, with most sitting in the $A190 range, and the most expensive, the TRX Tactical Gym that the US Armed Forces use, is only $A318. When you consider the added benefits of not really needing to buy a gym membership or pay $US20 for every yoga class, it’s a pretty great deal. 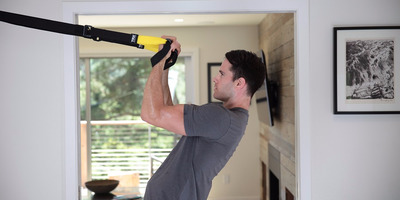 Hetrick has been featured on HISTORY’s “Million Dollar Genius” and has expanded the company to include apparel, workout programs, accessories, training tools, and different versions of the classic TRX training equipment. It’s not exactly hard to award some credence in good faith to the equipment alone for the fast success. In five years, Hetrick went from selling the equipment out of the back of his car to pairing with NFL quarterback Drew Brees and being adopted as a staple component in US Marine Corps training. It started with the simple task of using the most minimal tools to challenge the body into SEAL-grade excellence, and it’s evolved into defining what exactly suspension training is and means. But for efficacy, portability, affordability, and a star-studded following that truly swears by its abilities, it’s not exactly difficult to imagine why the TRX has been met with such success. If you’re interested in trying it out, you can buy it on Amazon or TRX’s site. This article was originally published on 3/30/2017. If you want to see more from Insider Picks, we’re collecting emails for an upcoming newsletter. You’ll be the first to hear about the stuff we cover. Click here to sign up . This article originally appeared at Insider Picks. Copyright 2017. Follow Insider Picks on Twitter.